At the time of Eid ul-Adha, which marks the end of the Muslim pilgrimage to Mecca; Hanukkah, when Jews commemorate the dedication of the Holy Temple in Jerusalem; and Christmas, when Christians celebrate the birth of Jesus, we look back, yet again, on a year that could have been. Muslims, Jews and Christians are bound by a common heritage under one God. The coincidence surrounding the timing of our religious celebrations reminds us that we share similar mechanisms for spiritual renewal. It reminds us that we share the sin of departure from true fundamentals as well. It is ironic that in attempting to preserve the traditions and customs of our shared civilization many individuals are undermining the very foundations upon which it was built. For many in the Middle East, 2010 was a year that began with much promise—even hope. The implications of a renewed and sincere U.S. rapprochement with the region and the Muslim world, as outlined in June 2009 by U.S. President Barack Obama in Cairo, was to begin in earnest during this time, healing old wounds and rebuilding fractured relationships. A change in tone and attitude seemed to augur something deeper: that after more than a decade of war, strife and misery in the Middle East, the international community agreed that enough was enough. The Israeli-Palestinian issue was the major testing ground for this newfound emphasis, especially for those in the region. But there were other indicators of change. U.S. troops began their withdrawal from Iraq, and a new Iraqi government was formed. This was to be the year in which renewed efforts would keep al Qaeda in Iraq at bay, and the global economy would finally reassert itself after the shockwaves of the greatest economic collapse in almost a century. The story that has instead unfolded is one permeated with the strange logic of failure. The vast majority of U.S. troops have now left Iraq, but the coalition government that remains has taken months to form after inconclusive elections in March. Even before the outrageous murder of Iraqi Christians at a church service in Baghdad on October 31, dozens were losing their lives every single day in Iraq. One of the region's oldest religious minorities is now fleeing en masse. Al Qaeda remains embedded in Afghanistan and areas of Pakistan, while Yemen has become the latest theater of terrorism. Dubai was wracked by financial havoc, while Iran continues a delicate diplomatic dance regarding its nuclear intentions—and Israeli impatience deepens. As for the Middle East peace process, there is little that has not been said. Many assume that there can be no two-state solution if settlement building continues. Ten years into the new millennium, we enjoy the benefits of staggeringly advanced technology. We can communicate across time and space effortlessly. We have traveled to the moon, explored the deepest depths and rendered the earth a village. Yet we seem to lack the ability to shape the world as we see fit, as the post-WWII generation once did with the development of new international institutions and hope. Like them, we must once again transform thought and conviction into action. Looking back at 2010, the Middle East appears as a place of extremism. Nothing could be further from the truth. However, it does face extreme challenges. Arab nations continue to fiercely guard their own interests, despite the lessons learned from our historical legacy. Fifty-five million young people are unemployed in the Middle East, and since 1990, wars have created more displaced persons than in any other period. Eid ul-Adha, Christmas and Hanukkah are occasions to give thanks, occasions that offer an opportunity to look back. The year of 2010 has seemingly not brought significant change or peace. However, we remain thankful that it has not brought more war. What it has brought instead is perhaps a keener understanding of the gravity of our problems, the costs that will have to be incurred to solve them, and a greater understanding of the wider repercussions should we fail. In 2010 we, the international community, stand humbled, aware like seldom before of the almost impossible challenge we must face. In order to emerge from this stalemate, we must appeal to our common ethics and values—to our common humanity. These values lie at the heart of our respective faiths and offer us the guidance to put "anthropolitics" into action. 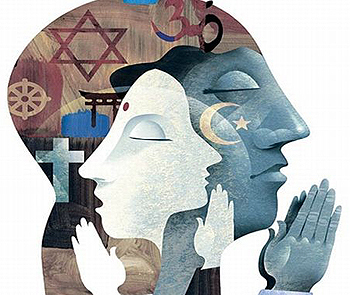 Recognizing these commonalities can inspire those of diverse faiths to collectively promote human welfare. Most importantly, we need hope, which can be brought about only by statesmen with a vision for a better and humane future, rather than politicians concerned with popularity and mere political survival. Ultimately, we need to close the seemingly widening gap between rapidly developing technology and our traditional values and morals. His Royal Highness Prince El Hassan bin Talal of Jordan is president emeritus of the World Conference of Religions for Peace and president of the West-Asia North Africa Forum. This article was written for the Common Ground News Service: www.commongroundnews.org.